Martha Ann Morris was born in Monroe County, Mississippi in 1828 where she was enslaved to John Crosby. When John Crosby died, Martha became the property of John H. and Nancy Crosby Bankhead. Nancy and John Bankhead joined the Church of Jesus Christ of Latter-day Saints in 1844 and 1845 respectively. Martha Ann Morris was likely baptized around the same time, although a baptismal record does not survive. The assumption that she was LDS is based on the fact that her husband and children were LDS, but to date no record of her LDS membership has been found. Martha likely migrated to the Salt Lake Valley in 1848 in the Heber C. Kimball Company along with John and Nancy Bankhead, however she is not mentioned in overland records (she appears in the pioneer roster as a number, with no name). Martha is also unexplainably absent from the 1850 census. The date of her manumission is uncertain. She married Green Flake, probably in 1852, though no official verification survives. Little is known about Martha as few sources mention her. Her two children were named Lucinda Flake, born 1854, and Abraham Flake, born 1860. 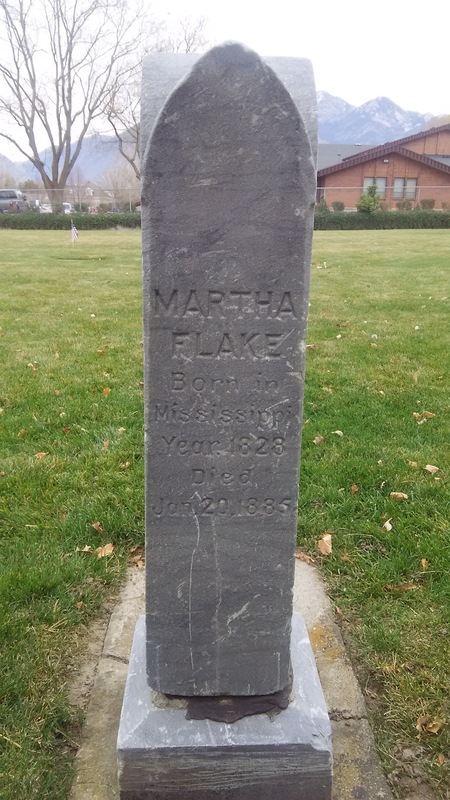 Census records indicate that she “kept house.”  Martha died January 20, 1885 in Union, Utah. She and her husband Green are buried in the Union Cemetery in Salt Lake County. United States, Census. 1860, 1870, 1880, Union, Salt Lake County, Utah Territory. Madsen, Steven K. A Union, Utah History. Union, Utah: Jordan Valley Sentinel, 1981, 46-58. United States Census, 1860, 1870, 1880, Union, Salt Lake County, Utah Territory.